If the eyes are the seat of the soul, they are the foundation of beauty. The eyes are a beautiful, intricate and unique structures and are the first thing that humans notice about the face of other humans. 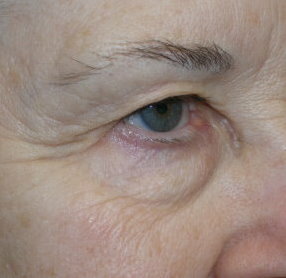 The youthful eyelid is tight, well defined, sculpted and is one of the basic clues about ones age. As we get older, the upper face ages more rapidly than the lower face and it is not uncommon for me to perform eyelid surgery on patients in their late third decade and through their eight decade. A healthy person is never too old to look younger! Most us that are over 35 can testify to the subtle changes that begin in the mid 30’s. Usually we fires notice the “crow’s feet” wrinkles that develop on the side of the eyes and are accentuated when we squint and smile. The next change that becomes apparent is the excess skin that forms on the upper and lower eyelids. The upper lids get droopy and the excess skin can lie on the eyelashes or lower. This can actually obstruct a patient’s vision and if this is the case is often covered by health insurance. 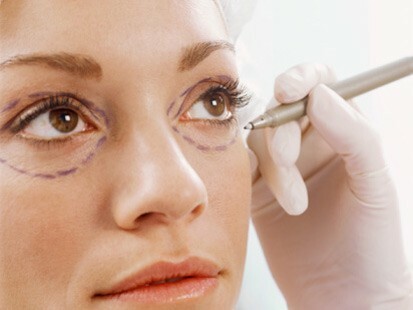 For a cosmetic procedure to be covered, the patient must first visit their eye doctor and undergo a test to see if the skin excess qualifies for insurance. Women will notice that they can no longer wear eye shadow because the eyelid shelf (the area above the lashes) is covered with skin. Men will usually notice that their eyes look smaller. The other big change is the development of fat bags around the upper and lower lids. The eye is surrounded by a protective cushion of fat and as we age, the tissues that keep the fat in place weaken and the fat pockets protrude under the skin. This (along with skin changes) gives patients a puffy and tired appearance. It is not usual for patients to present to the office and say “Dr. Joe, I work out, watch my diet and take care of my self but I always look tired. My friends ask me if I am stressed or not sleeping!” What these patients are actually saying is that they have aging changes in the eyelids. The above picture illustrates aging changes in the eyelids. Many patients that think they need eyelid surgery actually need brow and forehead lift surgery. See this topic on my previous blog topics. Brow and forehead lift is sometimes performed alone or with the combination of brow and eyelid surgery. 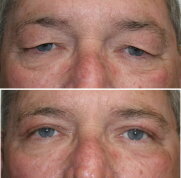 The photo below shows a patient with a tired appearance that was refreshed with brow lift and eyelid surgery. The above patient complained of looking tired and was treated with brow and forehead lift and blepharoplasty (cosmetic eyelid surgery). Upper eyelid cosmetic surgery is a relatively standard procedure in that an incision is made on the upper lid and excess skin, muscle and fat are removed or recoutoured. The procedure takes about 20 minutes per upper lid and stitches are placed the dissolve or are removed at about 5 days. The recover for upper eyelid blepharoplasty is usually about a week although most patients could don sunglasses and go about their business (excluding heavy lifting) in several days. Many surgeons use scalpel or scissors for eyelid surgery. Dr. Niamtu performs all his cosmetic eyelid surgery with high technology modalities such as lasers and radiowave surgery. By using these advance devices, there is virtually no bleeding. This means less pain, swelling and bruising and a faster recovery. Lower eyelid surgery is more diverse in the number of surgical approaches the doctor uses. Basically there are external approaches which leave a scar on the lower lid and internal approaches which are performed from the inside of the lower eyelid (transconjunctival approach) that leave no scar. Dr. Niamtu generally uses the internal approach due to the fact that there will be no scar and also there are less complications with lower eyelid position with this approach. Using the external approach can cause a pulled down lower eyelid which is not a problem with the internal approach. When using either approach, the excess fat is reduced or repositioned to improve the bags under the lower eyelids. This represents the first part of the operation and the second part is tightening the excess lower eyelid skin. This thin, crinkly skin is addressed by numerous methods including cutting, lasering and chemical peeling. Dr. Niamtu prefers treating the skin with the laser as there are no incisions. The upside of the laser is that it makes new skin. The aged skin is removed as well as pigment that contributes to dark circles under the eyes. The downside is that the recovery is longer as the patient cannot wear makeup for about 10 days and will have some residual pinkness that can be covered with make up which can last up to several months. The best results are available with the laser if the patient can tolerate the recovery. Dr. Niamtu prefers chemical peel as the second option for lower eyelid skin tightening. Although not quite as effective as the laser, the chemical peel also tightens the skin and removes unwanted skin damage and has a much shorter recovery which is usually a week and the patient is back in makeup. A third method of tightening lower eyelid skin is to remove a small amount of skin. Dr. Niamtu usually reserves skin removal for selected patients that are not candidates for laser or chemical peel. The patient plays an important part in the success of any operation and especially eyelid surgery. Serious complications are rare with eyelid surgery. Bleeding behind the eye can be catastrophic and although very rare can be caused by bending, lifting, over activity, high blood pressure and medications as simple as aspirin that can affect the clotting system. It is vitally important to adhere to the pre and post operative instructions provided by our office. The following pictures show before and after cases of cosmetic eyelid surgery. Dr. Niamtu and his staff invite you to visit our office for a free consult for eyelid rejuvenation as well as visit our website www.lovethatface.com for more information about Dr. Niamtu and cosmetic eyelid surgery in Richmond, Virginia.